While there are several VPN providers in the market, there are very few with their own proprietary technologies. VyprVPN is one of those few, with their Chameleon technology that uses OpenVPN with 256-bit encryption. It scrambles the metadata that makes it difficult to detect. This helps it bypass VPN blocking. If you're planning to travel to China, VyprVPN can be an amazing choice for you. As you might already know, not many VPNs work in China, and because most of the free internet is blocked there, you'll need a VPN for sure. VyprVPN will help you access the internet in China if you install it on your device before you land in China. 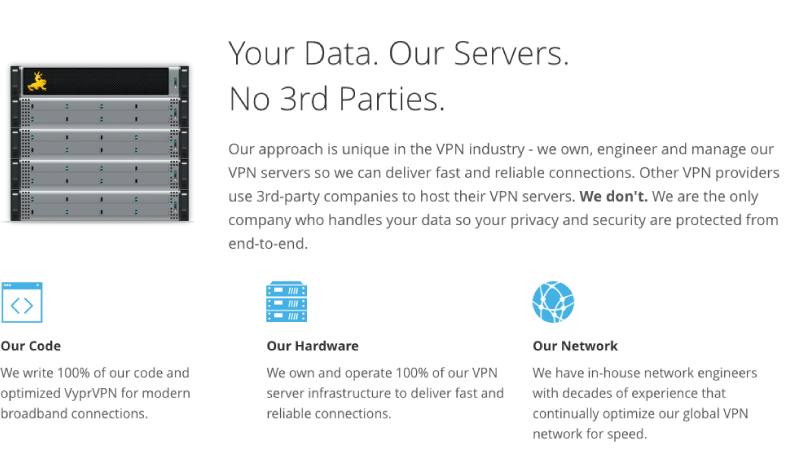 VyprVPN offers separate services for home and business users. They have a 3-day free trial so you can test their services before subscribing. However, they don't offer a money-back guarantee unlike some other major VPN vendors, and this might come off as a limitation to some users. VyprVPN claims to have a 24/7 live chat system but their claim falls flat as their live chat redirects you to their ticketing system. And it takes about a day or two for them to reply. They are also on social media but when I tried contacting them on Facebook messages, they weren't very responsive. However, it's not a completely bad deal. VyprVPN offers a forum where they have members and customer service guys actively participating. You can post your question there. If one of their experts doesn't answer, you just might get an answer from another user. Also, they have a good knowledge base that might solve your issues before you have to contact customer support. While a knowledge base and forum cannot replace an active customer support, having them is helpful. VyprVPN has two plans—VyprVPN and VyprVPN Premium. The first one is less expensive and gives you access to three simultaneous connections on one subscriptions. The premium plan, however, offers five simultaneous connections along with VyprVPN Cloud and the Chameleon protocol. With these attractive features, it's better to go with the Premium package. Both plans come with a 3-day free trial, but you'll need to enter billing information to access the trial. For businesses, they offer plans with or without cloud storage, and a short free-trial period. The business cloud plan lets you have a dedicated IP as well as a dedicated server. Making payments is very easy. VyperVPN accepts credit cards, PayPal, and Alipay. If you're someone who might want to pay through Bitcoin, you'll be disappointed to hear they don't accept cryptocurrencies. 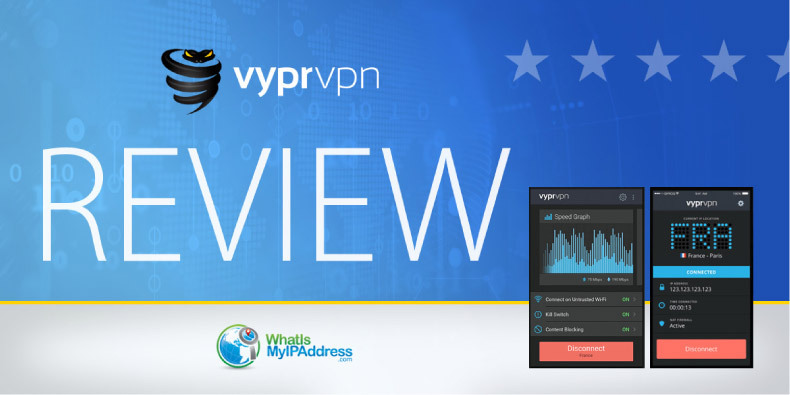 VyprVPN offers apps for several platforms—including Windows, Mac, iOS, and Android—that are easy to install and use. Once the app is installed on your device, you just need to run it and click on Connect to stay protected. There are options to select the location you want to connect to. While the apps are simple, they also have advanced controls for seasoned users. There are platforms for which they don't provide apps but you can still run VPN on them through their configuration files. VyprVPN can run on several platforms and devices, including routers, Linux, Blackberry, Boxee, and others. They also have a knowledge base to help you out with the frequently asked questions about installation and use. VyprVPN will help you access Netflix if you ever run into a block, which is a great feature. The speeds are generally good with VyprVPN, but they can be slow at times.